The recent rainy days turn Sabah into a cool place, so having a bowl of delicious Soto noodle soup is a delightful way to warm my stomach. 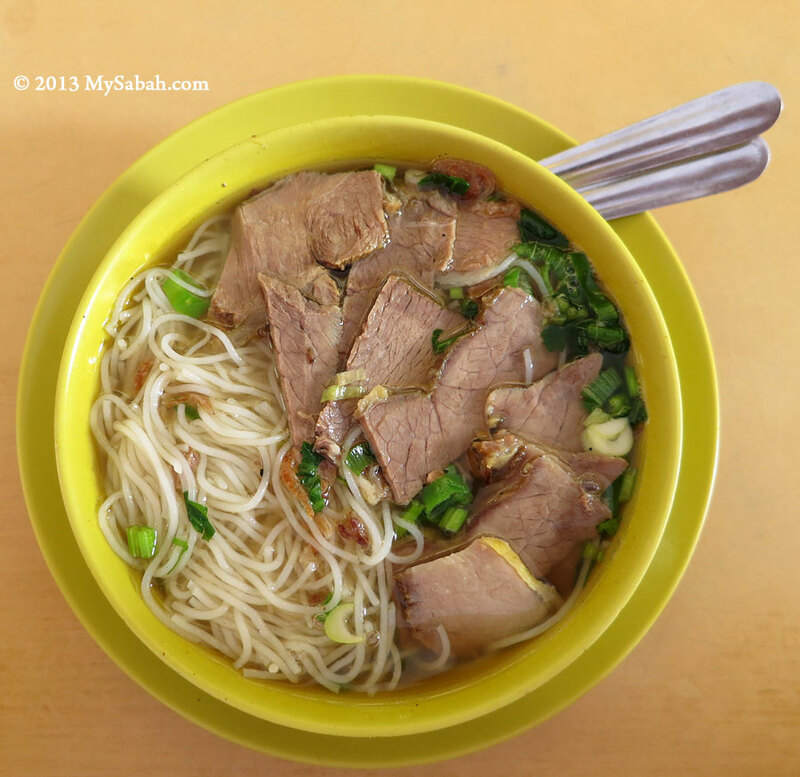 Soto is a beef soup served with Mihun (rice vermicelli). 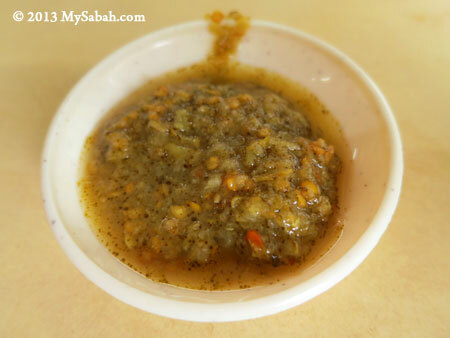 It is so common that you can find it in almost every Malay or Muslim restaurant in Malaysia. Though Soto is everywhere, few restaurants offer very good Soto. To save cost, the cook would use beef bouillon cubes for the soup. 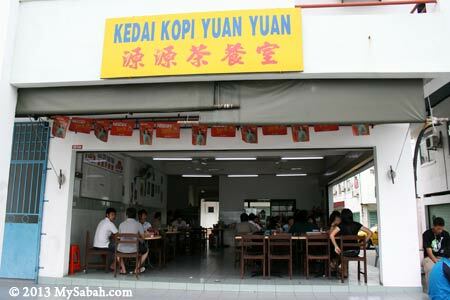 The best Soto I have so far is at Kedai Kopi Yuan Yuan (源源茶餐室 in Chinese) in Tawau, east coast of Sabah. You might be surprised that it’s a Chinese restaurant. 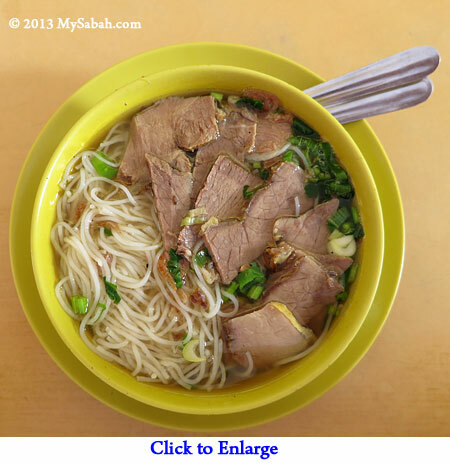 Same as traditional Soto, their beef broth is flavorful, but cooked with spices (e.g. pepper, cinnamon, star anise, lemongrass) in Chinese style. 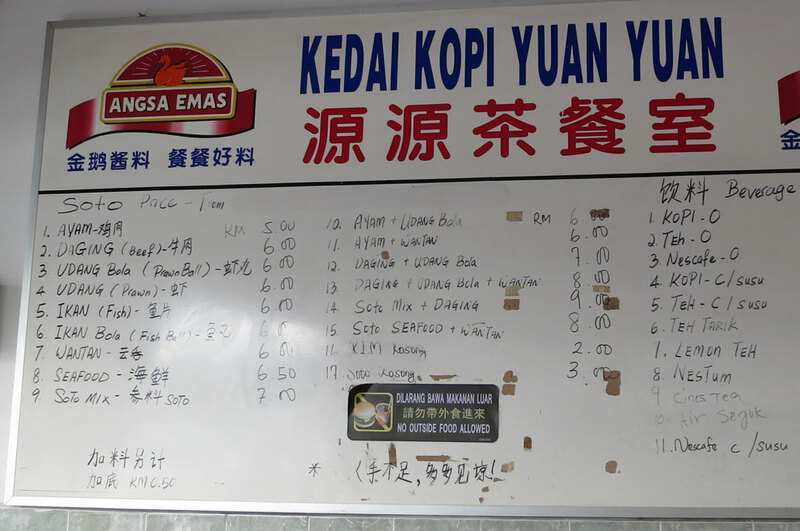 Though Yuan Yuan is not a Halal (for Muslim) restaurant, they serve no pork (to some Sabahan Muslims it’s ok). What does the full house photo above tell you? It’s a social proof of excellent food. I had to wait nearly 10 minutes for an empty seat, but I was more than happy to stand behind a long line for the best Soto. The workers there were as busy as bees, to serve the noisy customers who sounded like hungry chicken waiting to be fed. 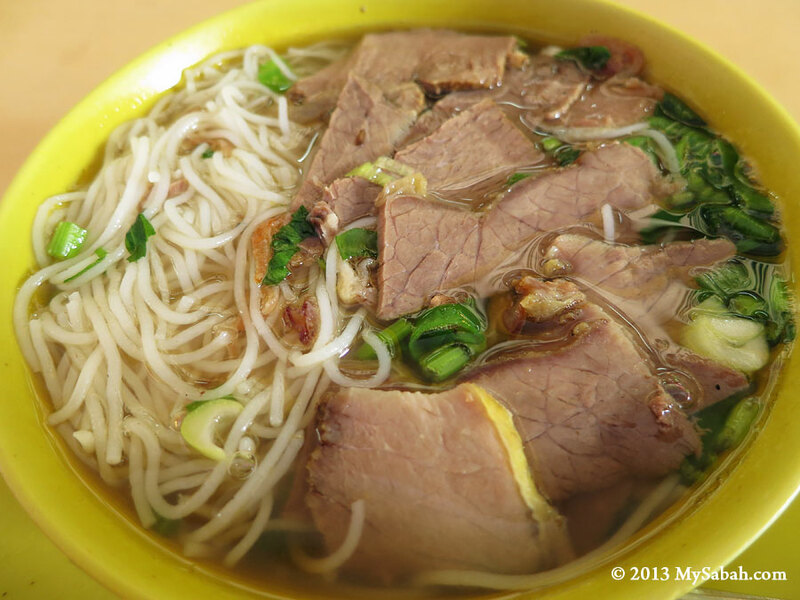 The Soto of Yuan Yuan comes with a few flavors such as Daging (Beef), Ayam (Chicken) and Seafood. As there were many customers, I had to wait another 10 minutes for my Soto Seafood. My mouth was dripping just by smelling and looking at it. 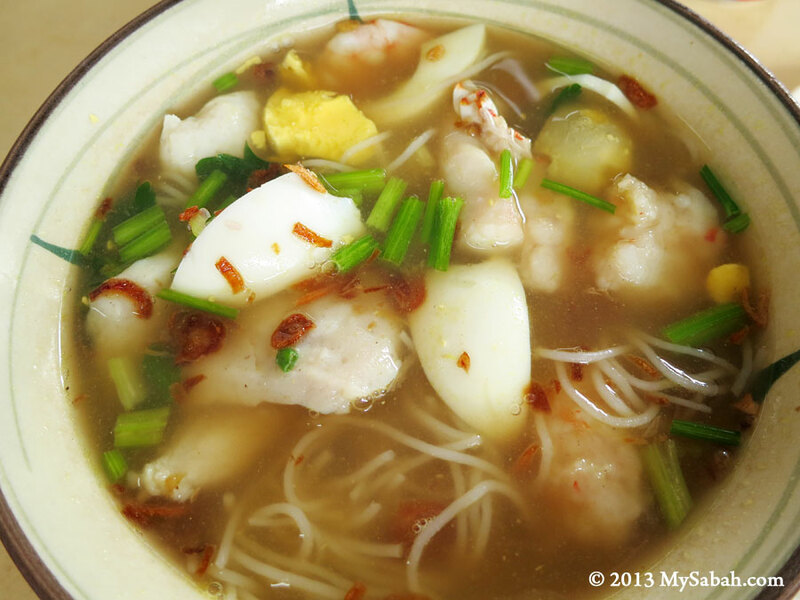 My Soto Seafood noodle soup has fish balls, prawns and egg, with fried garlic and sliced green onion as condiment. 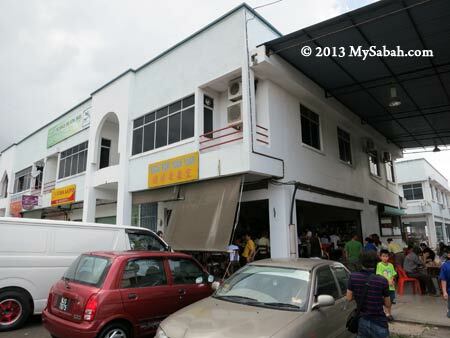 Tawau is abundant with seafood, and from the taste, I can tell they use fresh seafood (instead of frozen one). 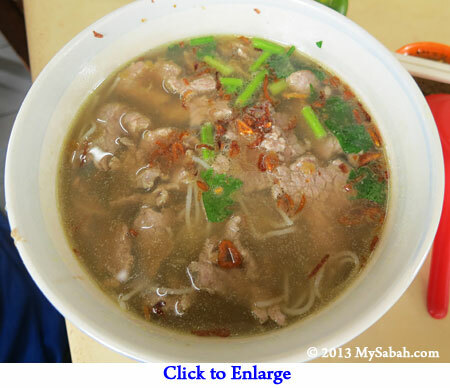 Their beef soup is richer and darker than other Soto. 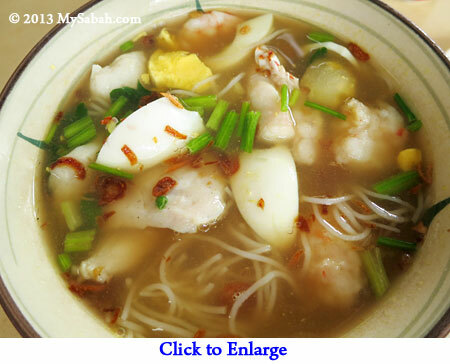 The soup also has strong pepper flavor, with mild spicy taste and very appetizing. 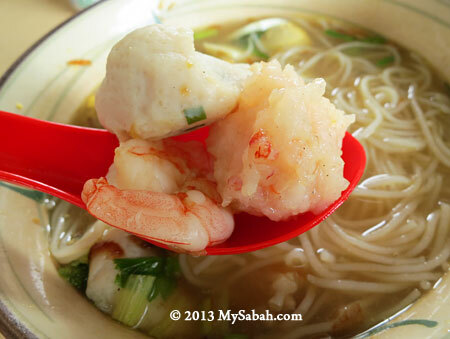 The soup is not oily, and I give A+ to their fish and prawn balls as they are springy, and without heavy use of flour. 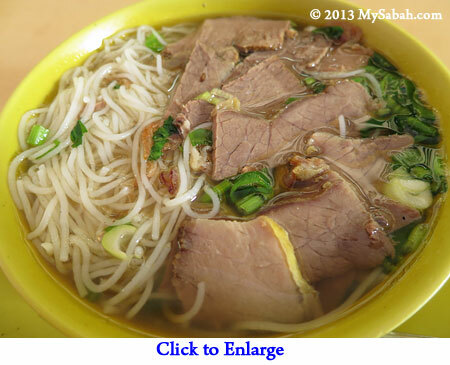 I notice they don’t use cucumber slices, which are used a lot in other Soto (because it’s cheap). 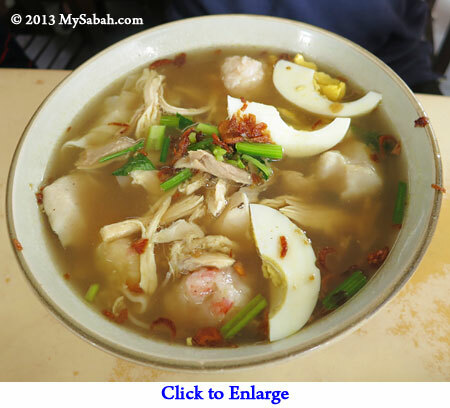 Pic: Soto Campur (Mixed), if you like to have beef, chicken and seafood in one serving. 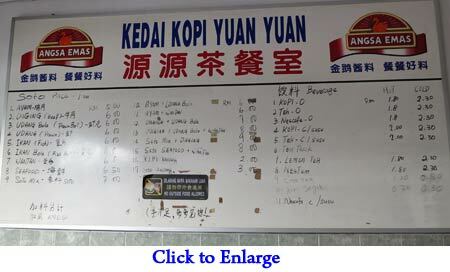 Personally I think you must add a bit of minced chili made by Yuan Yuan. Unlike the sharp hotness of red chili that attacks only tongue, you can feel heat spreads in your whole mouth as if it’s fire inside, quite potent in a pleasant way. It tastes more like pepper though. 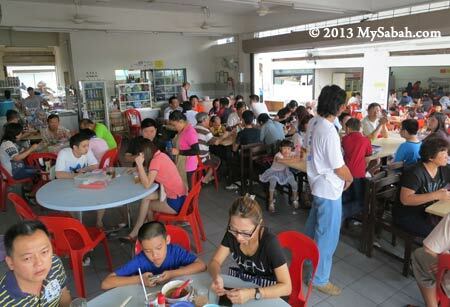 Pic: the best time to drop by Yuan Yuan is after meal hours in weekday, when there are less people. 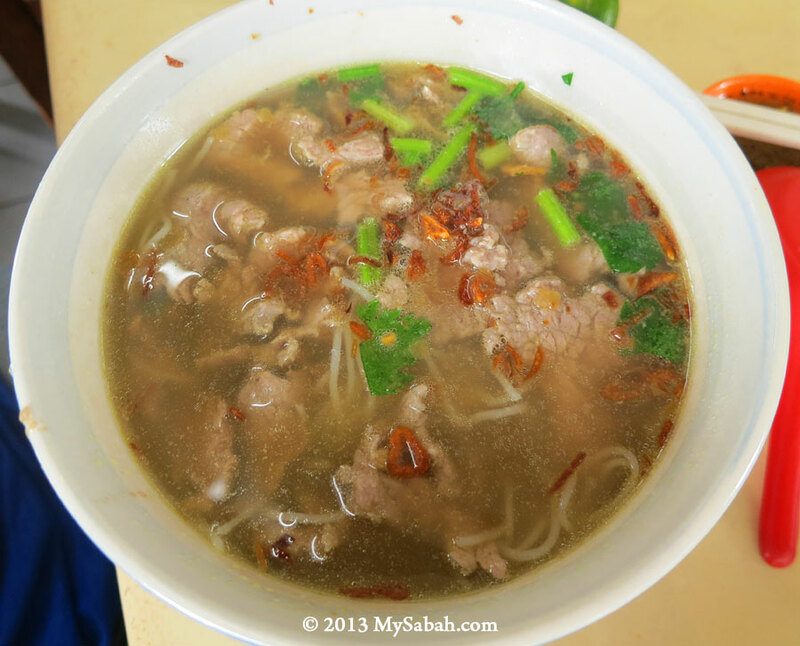 Another nice place for Soto noodle soup is Restoran Happy Muslim (non-Muslim is also welcomed) in Kota Kinabalu city center. 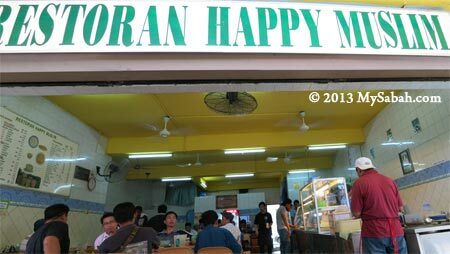 It is a Halal restaurant that serves true Malay style Soto. The soup is clear and it tastes slightly bland, but highly recommended by many. Sometimes I saw tourists tried the Soto there too. 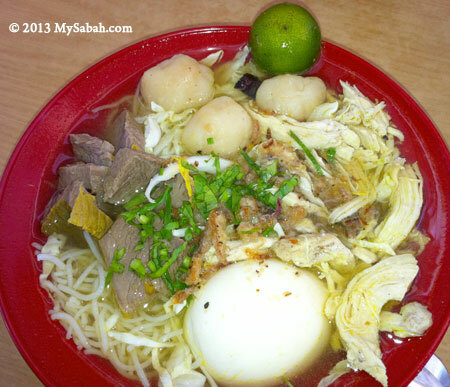 There are many types of Soto that bears different names and getting popular. 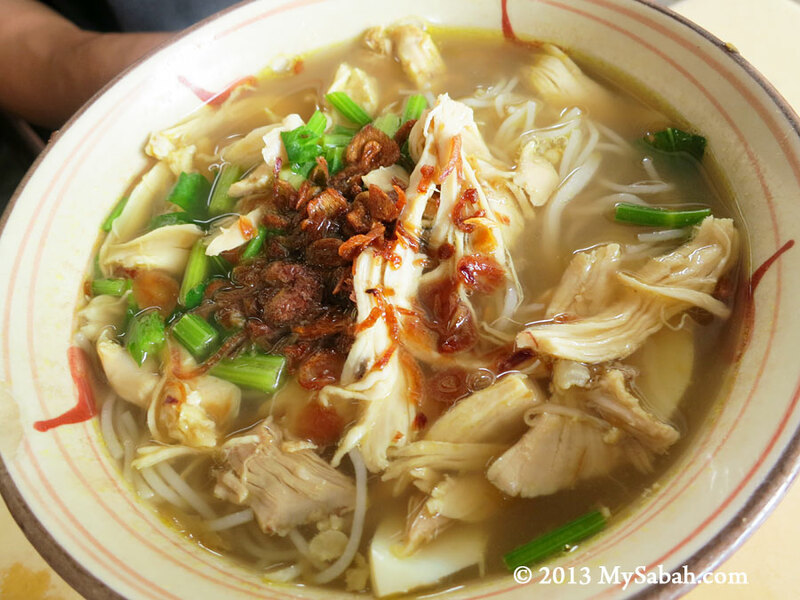 You can find the following Indonesian-style Soto in Sabah too. 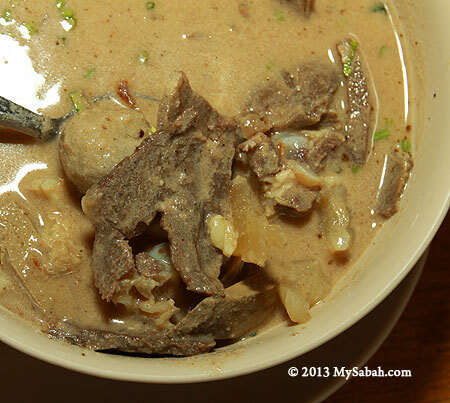 Coto Makassar originates from South Sulawesi. I tried this Coto in Restoran Sri Mandahan next to the road near to Bongawan town. Coto has grinded peanut in the beef soup so the taste is sweet. 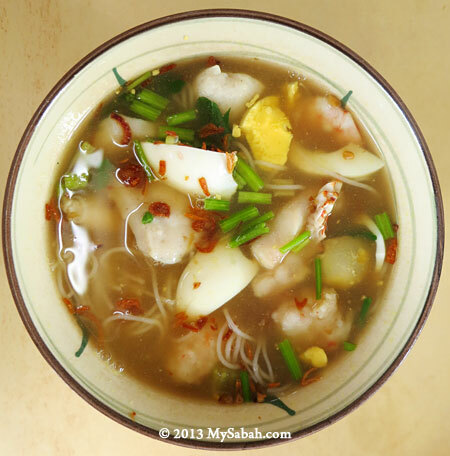 Instead of noodle (rice vermicelli), you eats it with rice cubes (Ketupat). 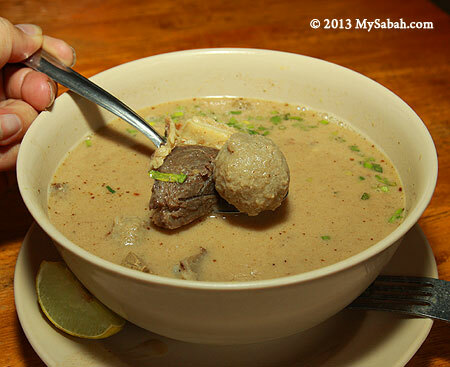 Bakso is Soto in Bugis style actually. The highlight is the meatball, which is commonly made from beef or chicken. By the way, I was told more than once that Soto can relieve hangover. Now is the month of Kaamatan (Harvest Festival) and everyone will be drinking a lot. 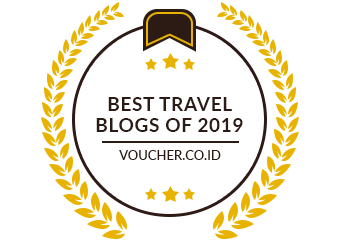 Hope this tip will help you, haha.